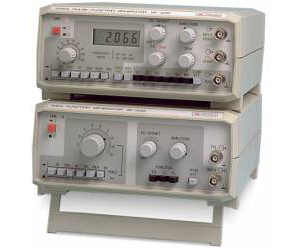 The GF-232 is a function generator with a frequency range of 0.2 Hz to 2 MHz in seven decades. It generates sinusoidal, square, triangular, and pulse waves. It includes a signal symmetry control that enables the instrument to generate a sawtooth signal. The GF-232 provides digital frequency indication, and contains a power amplifier of up to 4 MHz with a 50 ohm impedance, a variable-level comparator, and a frequency meter of up to 10 MHz (5 digits).